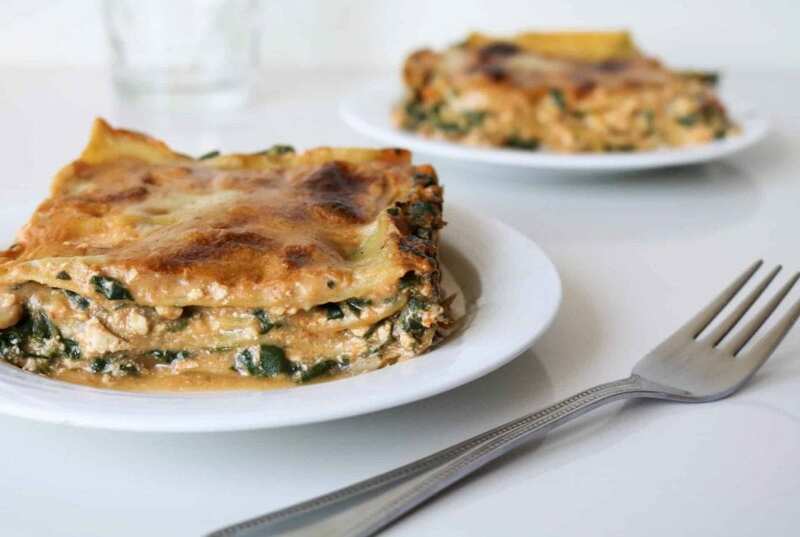 My love for this Italian dish prompted me to create a recipe for an easy vegetable lasagna that tastes just as good as traditional lasagna but with some spinach and mushrooms make it just a tad healthier. 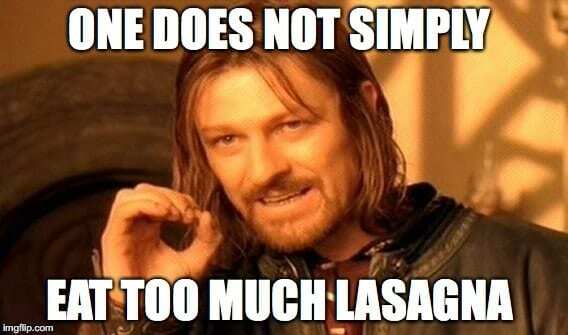 In my mind, lasagna is just spaghetti flavoured cake and, like cake, it gets devoured. There is never enough lasagna to satiate me. I just cannot resist that distinctive smell of melted cashew cheese when it comes out of the oven all hot and steamy. Needless to say the lasagna does not survive for very long after that. Since I love lasagna so much I decided to share this recipe with you all but I made a slight adjustment. If you’re like me and can eat lasagna by the bucketload you’ll appreciate that I made this easy vegetable lasagna just as tasty as traditional lasagna but with a healthy twist. 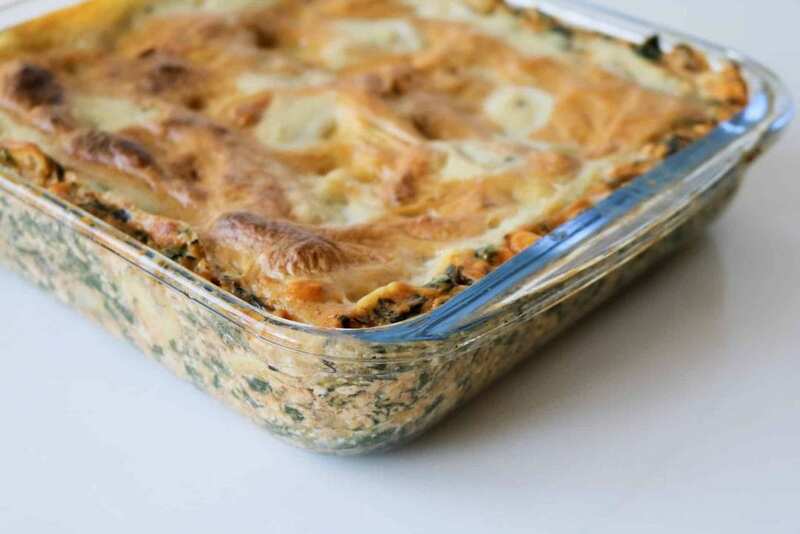 With the small addition of some spinach and mushrooms, you can eat away at this lasagna all you like! This recipe can easily be made gluten free by substituting the lasagna sheets for gluten free ones. Heat a saucepan over medium heat. Place all the ingredients for the white sauce into the saucepan and whisk to combine them thoroughly. The sauce should be heated slowly while stirring gently until the liquid starts boiling and thickens. Remove from the heat after 5 - 10 minutes. The sauce should be smooth and creamy. In a large bowl, add the tofu and start to break it apart until it reaches a consistency like ricotta cheese. Stir in the tomato sauce, miso paste, white sauce, paprika and sriracha until the mixture is well combined. Chop the cooked and drained spinach into fine pieces. Try and cut it as small as you can. 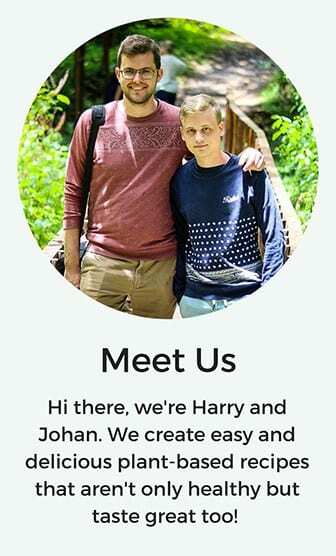 Add it it the bowl and mix to combine. You can add the cooked mushrooms if desired. The mixture is finished as soon as you've finished tasting it and adjusted the salt and pepper quantities to your liking. In a nine inch (23 cm) dish, add a thin layer of white sauce (keep a small amount aside for the top of the dish) and some of the filling to the bottom. This is to prevent the pasta sheets from sticking. Now add at the first layer of pasta and then a thicker layer of filling on top. Alternate between a layer of pasta and a layer of filling until the filling runs out. You should have a filling layer on top if you have split the filling up evenly between the layers. Spread the reserved white sauce over the top of the lasagna and add the vegan cheese if you included it. Bake the lasagna under the grill for 15 minutes until the top starts to crisp and turn golden. Let it cool for a few minutes, slice and enjoy! If you don’t have any vegan cheese lying around you can make this easy cashew cheese from my pizza recipe. It works a treat and give the top of the lasagna a beautiful golden glow. I hope you feel inspired to make this recipe and feel free to tweak it in any way you like. It is quite a robust dish so if you want to add a favourite spice or sauce, the lasagna will turn out just fine. Did you make this recipe? If you did, rate it and leave us a comment down below! We would love to find out how your easy vegetable lasagna turned out. Tag us on Instagram #deliciousplants so we can take a look! 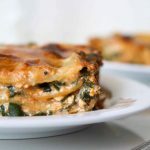 This recipe was inspired by The Vegan Corner’s Spinach Lasagna – I absolutely love their recipes, they are so professional and always turn out perfectly.